RL-GGP (Reinforcement Learning for General Game Playing) is a platform which can use and evaluate reinforcement learning algorithms for different types of alternating-turn games such as noughts-and-crosses (tic-tac-toe), draughts (checkers), chess, etc..). In order to do so, the platform integrates the General Game Playing server (see the Stanford University GGP group or the Dresden TU GGP group), which accepts any kind of game which is described in the Game Description Language (GDL) with the standard framework for reinforcement learning: RL-Glue using Jocular. Since the RL-Glue algorithm library does not contain too many algorithms, RL-GGP also integrates van Hasselt's RL library migrated to Java. This project was created with the intention to test different types of reinforcement learning algorithms in different types of games. This is more difficult than it sounds, since while there are tools and interfaces that allow for a general game description using GDL, we lack a general interface to use generic reinforcement learning algorithms for game playing. In order to integrate reinforcement learning algorithms to play general games it is necessary to adjust the rewards that agents receive in such a way that the algorithms learn (at the same time) the rules and the strategies of the same. In this context this project combines different tools and interfaces towards this goal. In this way, we have integrated RL-Glue with the GGP-Server, which loads the games through the Game Description Language. RL-Glue tool, despite its potential, does not (yet) have a complete library of reinforcement learning algorithms. Therefore, in order to work with various algorithms we also integrated the van Hasselt's algorithm library (http://homepages.cwi.nl/~hasselt/) in RL-Glue, so that they can apply them to any game. You can download the whole system package for academic use only and respecting the copyrights of the original parts (GGP, jocular, RL-Glue, Van Hasselt's library). For any other use or any commercial use *do* contact the authors. Versions for different platforms: Download the latest version. If you cannot find more GDL games in the GGP servers, you can download a few here. The codec can be downloaded either as a .tar.gz or can be checked out of the subversion repository where it is hosted. This codec can either be installed into a Java extensions directory, or it can be used uninstalled in ``free-float'' mode by specifying it in the Java classpath, when compiling and running Java classes. The advantage of the installed mode is that your system will always know where the RL-Glue classes are, so the code required to compile and run the applications is much cleaner. The downside of installing them is that Java will always find the extension classes first, meaning that you can not easily move between different versions of the classes just by specifying a different classpath. Below there are two examples of how you would work with the code, and then you can choose for yourself whether to install or not. The rest of this manual's instructions will all be written as if you have the classes installed, for clarity. This will provide you with a numbered list, prompting you to choose a Java extension folder to install to that is appropriate for your system. You can download de latest version of RL-GGP here. Once downloaded, extract the required directory. The user would only have to create a player with the algorithms developed by the user or with the algorithms which are provided by default, creating a *.jar of the class "main" of Jocular in the .\lib\jocular-0.2\jocular\src\java\stanfordlogic\jocular, where RL-GGP has been extracted. It is recommended that these players use the Eclipse tool, although in principle you can use any programming environment for implementing any change. In this case the player (jocular_remote.jar) would be listening on port 4001. Finally, in order to run the player you must create a file "config_agent.cfg" in the same directory where the player is (you can find an example of this file in the directory where the RL-GGP has been extraceted) . This file specifies the algorithm to be executed. You can download an example of the default jocular gamer of RL-GGP here. Then, we only need to specify the file with the GDL game (for example Tic Tac Toe or connect 4) and the connection parameters of each remote player which is listening, by selecting the host, port and REMOTE type, or if you use the default players given by GGP's own server. For more information about the use, installation, requirements or code of RL-GGP, you can download the project specifications RL-GGP (in spanish) here. A summary (in English) of the integration of van Hasselt's RL library into RL-glue can be founde here. 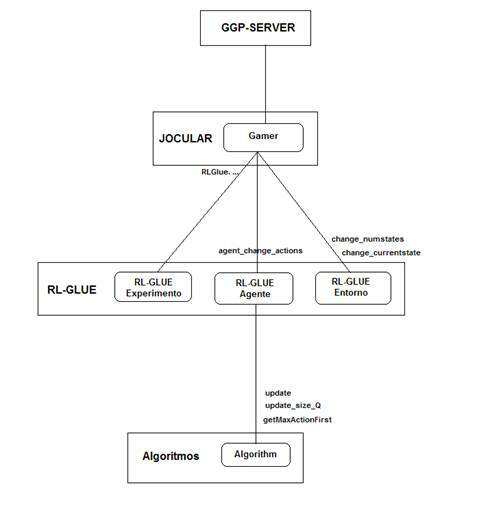 A summary (in English) of the integration of RL-glue and GGP via Jocular can be found here. This work has been performed under the supervision of Jose Hernandez-Orallo and the participation, software validation and comments from Javier Insa-Cabrera.